Bus drivers (especially school bus drivers), are amazing individuals. They must possess skills beyond those of ordinary drivers. They must know how to extend their senses through tools that enable an awareness of not only the situation on the road, but also on board the bus. 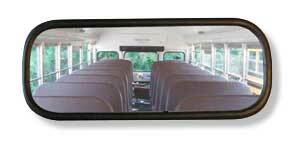 The interior mirrors below are necessary for monitoring those passenger area concerns.